Tl;dr: ApBleed is my proof-of-concept to test heartbleed against wireless networks. Patches welcome. Once the heartbleed vulnerability in OpenSSL was made public, most focused on its applicability to web servers. Other targets such as SVN servers, VPNs, etc. were also mentioned. However, there was little public discussion about the impact of heartbleed on wireless networks. Nevertheless, it was clear heartbleed was also exploitable against WPA1/2 enterprise networks, even if it wasn't discussed as publicly as other heartbleed stories. Normally enterprise networks use one of the many EAP methods inside an SSL tunnel to authenticate users. If OpenSSL is being used, this SSL tunnel might be vulnerable to heartbleed. Let's assume I'm a student at lsu.edu and currently visiting an institution of utk.edu. If I now connect to an eduroam hotspot, an SSL tunnel will be set up between my device and the RADIUS server of lsu.edu (i.e. my own institution). If my credentials are valid, lsu.edu will notify utk.edu that I should be allowed on the network. Why is this interesting for an attacker? Because the SSL tunnel is set up before user authentication, and even before you are assigned an IP. The only thing known about you is your MAC address and your "home" institution (i.e. the realm defining your home institution). Of course, an attacker can spoof both the MAC address and the home institution. The attacker only has to be within range of an eduroam hotspot, and he or she can pick any eduroam hotspot at will. 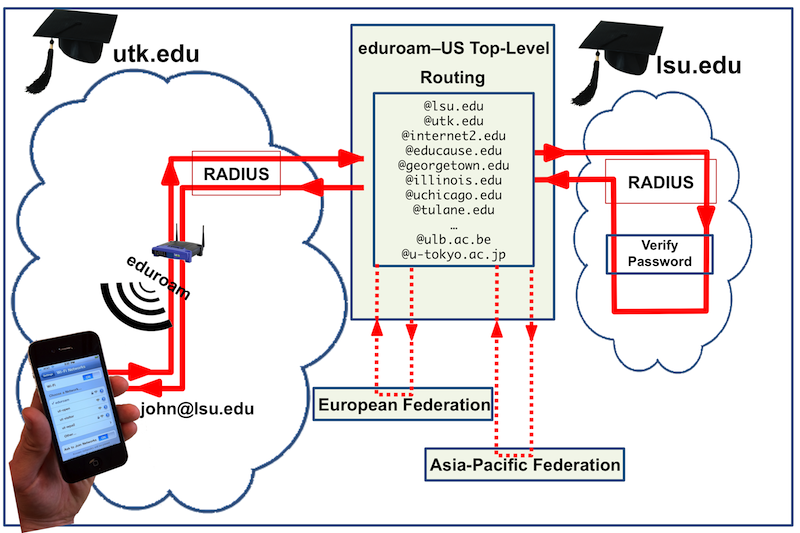 The eduroam network will then forward packets to the RADIUS server the attacker specified (i.e. the realm spoofed by the attacker). This is what allows a user to directly set up an SSL tunnel with the radius server of their home institution. However, this means we can anonymously connect to any institution we want! Following up on the heartbleed vulnerability in OpenSSL: it is confirmed that EAP-authentication in RADIUS servers is vulnerable to the attack. It is therefore extremely important to upgrade OpenSSL and restart RADIUS services as soon as possible. The attack is feasible from any public eduroam hotspot, not just your RADIUS peers. Though I focus on eduroam, every networking using enterprise authentication with an EAP method inside an SSL tunnel might be vulnerable to heartbleed. Nevertheless, eduroam is more interesting than your ordinary network, because it allows you to anonymously connect to any institution which has joined the eduroam federation. Few public proof-of-concepts were available (if any at all). I can think of three reasons for this. First, not everyone was aware enterprise authentication was vulnerable to heartbleed. Second, it's a little bit harder to make a working proof-of-concept against wireless networks. Third reason might have to do with the impact of public exploits. Because authentication (and hence the SSL tunnel) takes place before getting access to a network, it's not possible to consult a certificate revocation list (CRL) or query the certificate status online (with OCSP) [eduroam]. So revoking certificates is not possible. However, recently proof-of-concepts are being released. So it's time to release my own proof-of-concept as well :) I modified wpa_supplicant so, once connected to an AP and ready to talk to the radius server, it opens a local socket. This means you can now connect to this socket and pretend it's the RADIUS server. The big advantage of this approach is that you can use any existing heartbleed tool to test the radius server. Simply let the heartbleed tool connect to the socket created by my proof-of-concept. The code has not been tested thoroughly, but worked in all my small experiments. Get a copy of my PoC (called ApBleed) at github. Patches are welcome!